Some day I hope to meet the actor Will Smith. He’s a larger-than-life guy, and seems to have an uncanny knack for making connections (obviously). His stunt double does, too, and has taught me a few things about winning friends and influencing people, skills which have helped me get more clients. Getting more clients is the biggest challenge for freelance copywriters. We can talk about client acquisition systems, lead generation campaigns, and self-promotional marketing. But no matter how many prospects you have in your “funnel,” at some point it comes down to a one-on-one conversation, right? At that point you either land the project or not. Will Smith’s stunt double lights up a room when he walks in, and he takes a keen interest in every person he meets. When you’re talking to clients, are you putting their interests first? Before you start selling yourself, are you asking questions about their business? Their goals? Their life? Do they see how you can help them get from point A to point B? Clients don’t care about you. They care about themselves (we all do) and their business. Find out what their needs are, and offer an idea or two whether they hire you or not. Deliver more than what they expect. Good stunt doubles (like Will’s) do this, too, which leads to long careers. Think of your number one job as generating good ideas for your client. Make their business your business. Will Smith’s stunt double offers ideas on set regarding angles, positioning, and more. You can do the same. Bottom line? Consider things from your client’s point of view, and give more than you receive. Will Smith’s real stunt double is Randolph LeRoi, his personal friend since they met on the set of the original Bad Boys in 1994. 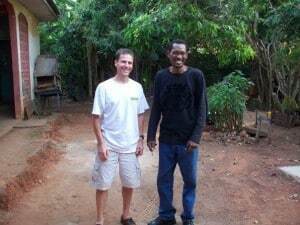 The guy in the picture with me is Soje Wangboje, my brother-in-law, with just as big a personality.